Analyzing CFA Level 1 Syllabus: What are the Important Exam Topics? » Analyzing the CFA Level 1 Syllabus: What are the Important Exam Topics? CFA Level 1 is the first exam you will encounter in the CFA exam journey. We cover the exam format, structure and historical pass rate in CFA Level 1 overview. This post focuses on the CFA level 1 curriculum and summarizes the 10 topic areas. The syllabus covers the structure of the Program, nature of the codes and standards, as well as the enforcement, application and recommended procedures. There are also examples on how the codes and standards can be applied, and recommended procedure should violations are made. On GIPS, the syllabus covers the background, key features, how they are implemented, and what to do if there is a conflict between GIPS and local regulations. Quantitative methods represents 12% of all CFA Level 1 exam topics . It introduces time value of money, descriptive statistics and probability as tools for quantitative methods. Time value of money calculations are basic tools used to support corporate finance decisions and to estimate the fair value of fixed income, equity, and other securities or investments. Candidates should understand interest rates and discount rates in the context of time value of money, and be able to perform various calculations e.g. finding the future value and present value, DCF, NPV and IRR. This section covers basic statistical concepts, such as defining a parameter and a frequency distribution, calculating percentiles, coefficient and sharpe ratio, and interpreting standard deviations and skewness. It also covers application such as sampling, estimation and hypothesis testing. This topic area represents 10% of CFA Level 1 syllabus. It covers the introductory concepts that students typically learn in first year of college. Microeconomics is a study on the market behavior of consumers and firms through the basic principle of demand and supply. Macroeconomic looks at the bigger picture, looking at the aggregate output and income measurement, factors on economic growth, business cycles, as well as how monetary and fiscal policies are used to mitigate economic fluctuations. We also discuss economics in a global context, notably international trade, capital flows and currency exchange rates. Financial reporting and analysis is the heavy weight in Level 1 representing 20% of the exam. This is essentially financial accounting 101 (or a shorter version of FAR in the CPA exam). It starts with the introduction of principal financial statements: the income statement, balance sheet, cash flow statement, and statement of changes in owners’ equity, together with notes to those statements, and management discussion and analysis of results. Various financial analysis techniques are covered as well. It also touches on financial reporting mechanism, such as the basic concepts of accounting equation and accruals. The roles of financial reporting standard-setting bodies and regulatory authorities is also discussed. Corporate finance is relatively small representing 7% of CFA level 1 syllabus. This section introduces the concept of capital budgeting, how to determine the required rate of return for a project, leveraging, alternative means of distributing earnings, and short-term liquidity and working capital management. Although Portfolio management is not heavily weighted in Level 1 (7%), this is an important section that sets the framework for later chapters. It also builds a good foundation for portfolio management in Level 2 and 3. Similar to most topic areas, Level 1 portfolio management is conceptual in nature. Specifically, it introduces the concept of a portfolio approach to investments. It also compares the types of pooled investment management products, risk management, portfolio risk and return measures, as well as modern portfolio theory. This topic area is quite important representing 10% of CFA level 1 curriculum. This session explains the market in which equity, fixed income, derivatives and alternative investments trade. It introduces the types of assets and respective participants, and how various investments are constructed and managed. It also briefly covers market efficiency. The other session focuses on the characteristics, analysis, and valuation of equity securities. The study materials cover the features of equity securities, role of investment management, how to conduct industry and company analyses, and understand a company’s competitive position. This weighting of this topic area is the same as that for equity investment, at 10% of level. Not surprisingly this is an introduction of the important fixed-income investments: the characteristics, primary issuers, sectors and types of bonds. It also touches on securitization and asset-backed securities. The discussion then move on to the calculation of price and yield, spreads, and understanding of spot rates, forward rates and yield curve.We also learn about measuring and analyzing interest rate risk and credit risk. Although derivatives are getting more popular, it is still not the mainstream investment product. The weighting in the CFA exam remains small at 5%. In level 1, this section introduces the understanding the basic derivatives (forwards, futures, options, and swaps), derivative markets, and the use of options in risk management. 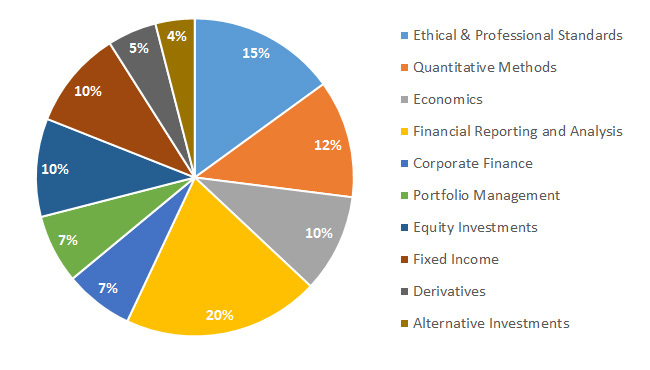 Similar to derivatives, the section on alternative investments remain small (4%) in Level 1 exam. This section describes the common types of alternative investments, their valuation, their unique risks and opportunities, and their relation to traditional investments. The coverage includes hedge funds, private equity, real estate, commodities, and infrastructure. Level 1 tests on a wide variety of topics, but they are related and build upon each other. As you progress to Level 2, all topics will be tested again but at a more sophisticated level.